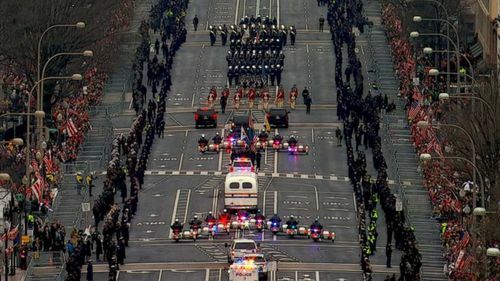 PHOTO: Participants proceed up Pennsylvania Avenue during the inaugural parade in Washington, D.C., Jan. 20, 2017. The White House has a new version of its website and a new leader in President Donald Trump, but he can’t seem to shake an old issue. 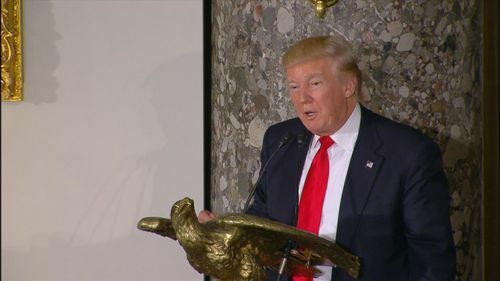 The first "We the People" petition to hit the website calls for Trump to release his tax returns. The president became the first in decades not to do so and controversy has swirled over what the documents contain. The petition, which was created today by "A.D.," has garnered around 3,000 signatures, far short of the 100,000 required by Feb. 19 for the White House to potentially review. 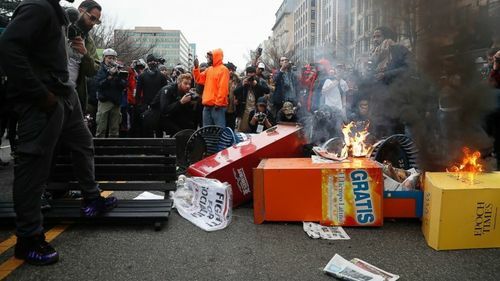 PHOTO: A Washington resident, left, guards a pile of burning newspaper machines to prevent protesters from feeding the flames while during a demonstration after the inauguration of President Donald Trump, Jan. 20, 2017, in Washington. 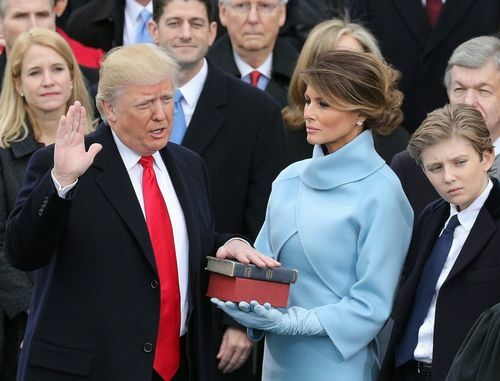 The Trump administration’s version of the WhiteHouse.gov website debuted today with an error in the 45th president's biography about his margin of victory in the 2016 election -- a mistake that was corrected a short time later. 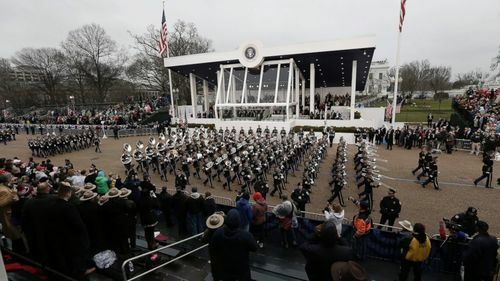 PHOTO: A band marches along Pennsylvania Ave. in front of the White House during the Inaugural Parade after Donald J. Trump was sworn in as the President of the United States in Washington, Jan. 20, 2017. ABC News' Tom Llamas reports on President Trump's first few hours in office and the weight of the responsibility he faces. 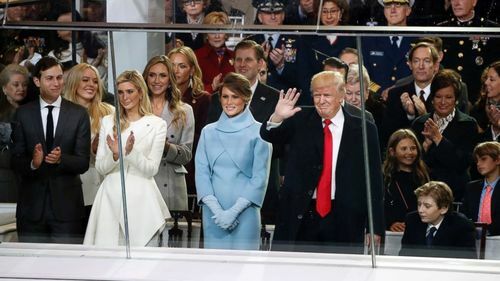 In his Inaugural Address Friday, President Donald Trump harshly criticized the Washington establishment. 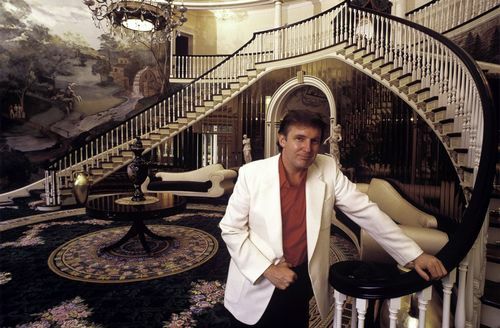 “The establishment protected itself but not the citizens of the country,” he said. 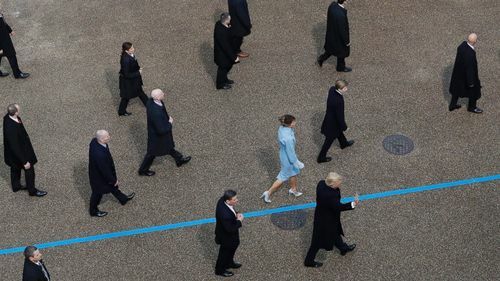 But just 15 hours earlier, at an exclusive black-tie dinner, Trump saluted the corporate bosses and wealthy elite who had contributed close to $100 million for his inaugural committee. 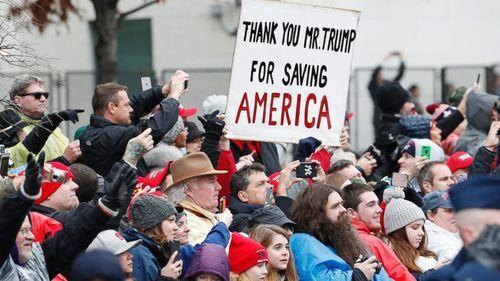 PHOTO: People hold signs along the route during the Inaugural Parade after Donald J. Trump was sworn in as the President of the United States in Washington, Jan. 20, 2017. The streets of Washington, D.C., are filled with people protesting Donald Trump's presidency. 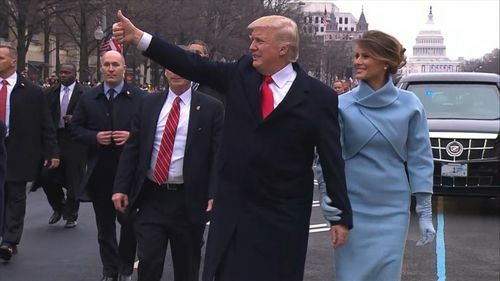 PHOTO: President Donald J. Trump waves as he walks with his wife Melania along Pennsylvania Avenue during the Inaugural Parade after he was sworn in as the President of the United States in Washington, Jan. 20, 2017. 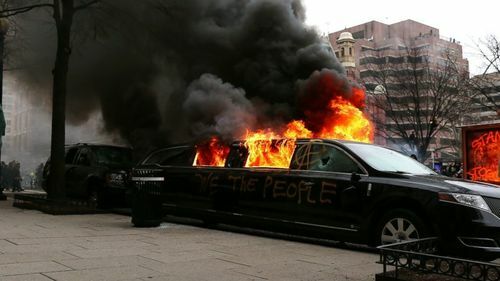 PHOTO: Protesters set fire to a limousine in the street, Jan. 20, 2017, in Washington. 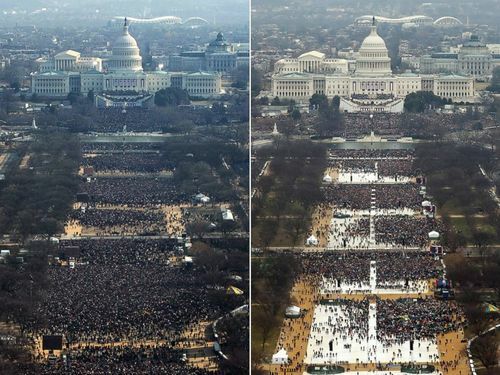 The National Park Service won’t be announcing attendance numbers for President Donald Trump’s inaugural ceremony, but photos of this year’s event indicate that it may have been less well attended than Obama’s in 2009. Read more from ABC News' Morgan Winsor. 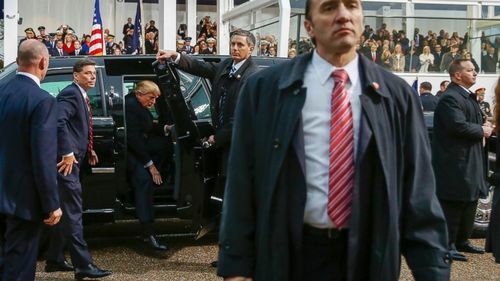 PHOTO: President Donald Trump steps out of his limousine during his inaugural parade on Pennsylvania Avenue outside the White House in Washington, Jan. 20, 2017. As President Trump makes his way down the inauguration parade route, the Senate is already back at work getting his Cabinet in place. Senators are set to vote on at least two nominations today: Gen. James Mattis for secretary of defense and Gen. John Kelly for secretary of Homeland Security. But there’s disagreement between parties on a third possible confirmation vote today -- that of Rep. Mike Pompeo to be CIA director. President Trump thanked his supporters and led a standing ovation for Hillary Clinton during his brief remarks at the inauguration luncheon. 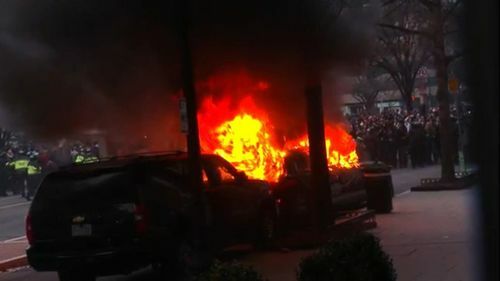 Violence flared on some streets of Washington, D.C, today amid Donald Trump's inauguration -- with people smashing car and store windows, clashing with police and even torching a limo. Police said they responded using pepper spray and other control devices. 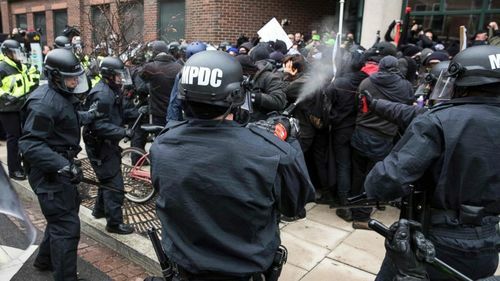 At least 95 people were arrested, the Metropolitan Police Department said this afternoon. Thousands of protesters fanned out across downtown Washington, D.C., in the morning, including some who tried to block security checkpoints to the inauguration festivities. Protests also cropped up in other parts of the country today, including San Francisco and outside of Trump Tower in New York City. Read more from ABC News' Michael Edison Hayden. PHOTO: Police officers pepper spray a group of protesters before the inauguration of President-elect Donald Trump, Jan. 20, 2017, in Washington. JUST IN: Secretary of Defense James Mattis is the first nominee to be confirmed by the Senate, according to ABC News' Ali Rogin. 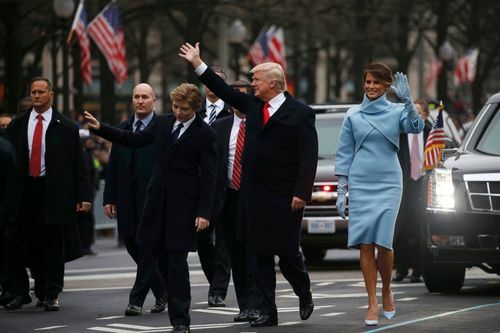 PHOTO: President Donald Trump waves as he is joined by First Lady Melania Trump and his family to view the presidential inauguration parade in Washington, Jan. 20, 2017. 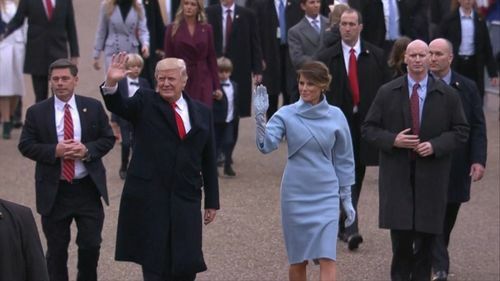 The new president and vice president of the United States paraded through the streets of Washington, D.C., after taking their oaths of office.